Until two years ago, Sansone was a corporate executive chef with Continental Services, with clients that included General Motors and Fiat Chrysler Automobiles. On July 27, 2015, Sansone was in a severe accident that left him a paraplegic. Rather than lamenting his misfortune, he saw an opportunity. “I was an in-patient with the Detroit Medical Center and started doing cooking classes with them. Then, Henry Bowman, of the Warren Parks and Recreation Department, asked me to consider doing cooking classes at the Warren Farmers Market. 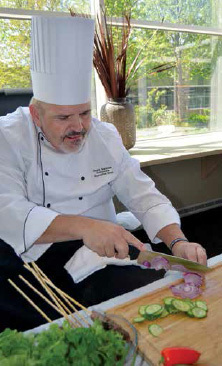 Rather than considering myself a disabled chef, I decided to name myself the Able Chef,” the 56-year-old Sansone said. “I saw Chuck on a Fox 2 News segment and knew he’d be perfect for our Farmers Market. We had cooking classes before Chuck and they were okay. From the day Chuck took over, we’ve run out of chairs. He’s a home run, an inspiration to people,” Bowman said. Held at 10:30 a.m. on the third Sunday of the month (May through October), the cooking classes at the Farmer’s Market range 60-90 minutes and focus on using fresh ingredients and attendees are provided with featured recipes so they can make the same dish at home. The classes are taped by Warren TV and are shown on the city’s cable network and are also available online. “We discovered that other people with disabilities found the cooking classes extremely helpful. We’re always looking for equipment that can make it easier for a person with disabilities to cook,” Sansone added.